Porcelain Restoration & China Repair - The Blue Tongue Studio is your first choice when it comes to requiring a professional & high quality porcelain restoration & china repair. We are dedicated to specialising in the conservation, restoration and repair to all fine antique porcelain, china, glass, ceramics, plaster & ivory. Most of you will have put aside broken or damaged objects to await restoration & repair! Search them out NOW! For all your Porcelain Restoration and China Repairs choose The Blue Tongue Studio. The Blue Tongue Studio is the world's first to offer Online Assessment for your damaged objects. Why? Don't Waste Time & Money Packing & Posting If It's Not Restorable! We will perform a professional porcelain restoration & china repair on your objects, bringing them back to a condition, where once again they can be enjoyed for their aesthetic, family heirloom, sentimental or sale values. We offer you a simple fast OnLine Estimate or a Studio Assessment A damaged object when suitably packed can be easily posted / delivered to the studio. 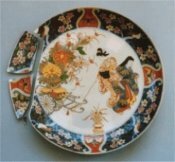 We repair all manufacturer's wares, Wedgwood, Minton, Doulton, Moorcroft, Spode, Lladro,Cornishware, etc. Modern artistic wares are also welcome. For a restorer it matters more as to what the object is made from and the damage it has, as to whom made it! To learn more about our porcelain restoration & china repair services click on the STUDIO page. We are collectors of Flow-Blue, Blue and White, Transfer Pattern and Fine Bone China / Porcelain wares, searching for works from the 'Goodfellow' factories of 'The Potteries' and 'Birks Rawlins & Co.' Over the years we have researched and collated a large amount of information on certain potteries we are interested in. A lot of information we have obtained has up to now been mislaid or hidden, since the days these potteries closed. Some of this information will indeed be the seed to rewrite certain aspects of history, with ongoing research creating many questions and different opinions to so-called known facts. Regular additions to this site will keep you informed. L.A. Birks & Co. [1894-1900] Stoke. England. Birks Rawlins & Co. [1900-1934] Stoke. England. Along with the history of this fascinating pottery business we have included images of wares and copies pages from the BIRKS RAWLINS COMPANY. PRODUCT CATALOGUE & TRADEMARKS. We know this will allow you to identify wares that you may have in your possession. This 'fine bone china' company produced many varied wares such as tea & coffee sets, parian busts, pate-sur-pate vases / plaques & crested wares. Wares were stamped with a variety of trade marks such as 'B.R. & CO.','Savoy China' & 'Carlton China'. We collect wares of this company and are always looking to make a purchase! Rhead & Goodfellow [1787-1812] Burslem. England. Bathwell & Goodfellow [1812-1823] Tunstall. England. For more than seventy years Thomas Goodfellow I & II were involved in three companies within 'The Potteries' of Stoke-on-Trent, England. Most of the production was of 'Flow-Blue', 'Blue and White' & 'Transfer Pattern' wares. Are Your Valuables & Collections Documented For Loss Through Disaster Or Theft? The Vine Pottery - Birks Rawlins & Co.